Thank you to R. Nour Jurgenson for sending these photos of her in action. She isn't wearing a parachute. Nour Jurgenson is a famous photo journalist based in Washington D.C.
Ron David is a celebrated writer and narrator. Ron and Nour have a fascinating and inspiring story. It's a love story filled with gutsy adventure. Ron, the son of an army intelligence officer, always had a love of flying. Growing up between Washington D.C and the Middle East, he had an adventurous childhood. Nour was born in Austria and she had an equally exciting childhood traveling the world. Her mother was an artist and her father was an engineer. 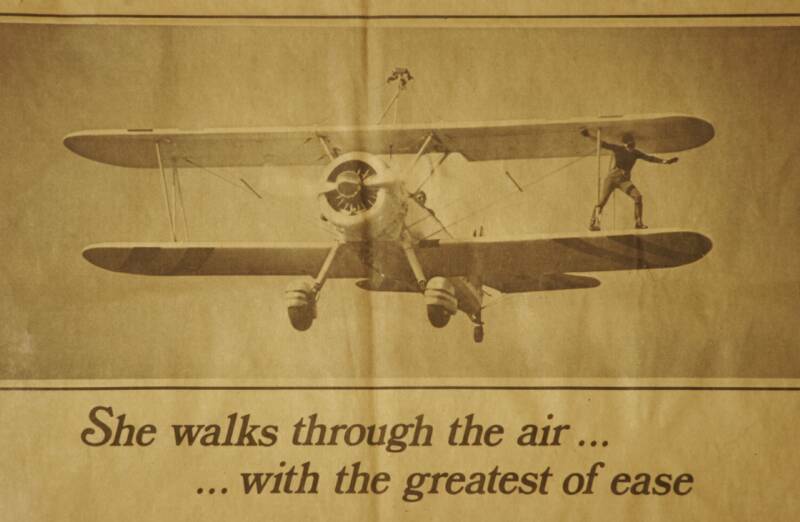 Their story begins when she answered an ad for wingwalking however their journey into wingwalking begins before that. Ron David loved flying but knew his eyes would never pass the strict regulations required for airline pilots. He instead realized the potential of his gifted voice and went into broadcasting. A graduate from the American Academy of Dramatic Arts he launched a successful narration career but he never strayed far from an airport. 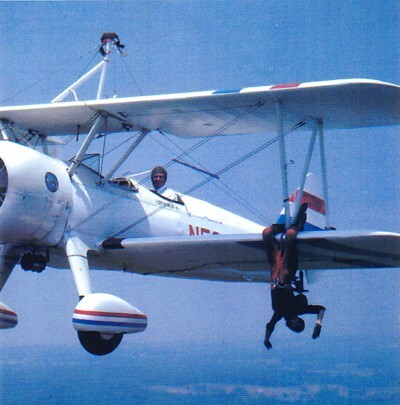 He bought several planes including a Citabria and he taught himself aerobatics. Today he is a well respected airshow announcer exciting crowds internationally. Click here to visit his web page. His talent is "putting the audience in the cockpit." Around the mid 1970s Ron went to see the Flying Circus airshow, in Bealeton, Virginia. He was recognized by the director. The director wanted to know what Ron thought of the show. Ron was honest. The director agreed and asked him to debrief the other performers. They appreciated his constructive criticism so much they made him director. Ron's focus for the show was recreating the Golden Age of Flight. The one aspect missing was wingwalking. 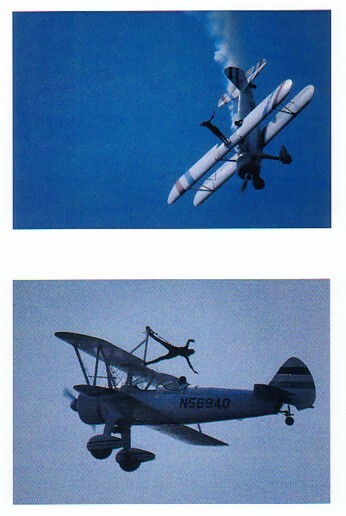 Now rules for wingwalking (basically wing-riding) were still very restrictive. A person had to be attached at all times to the top wing center section. Well the Flying Circus operated and still operates out of a grass field. Some grass fields, and this one was no exception, have ruts and bumps. Anyone familiar with this terrain knows one potential problem to trouble shoot would be what happens if the plane flips over with the wing-rider on the top wing. 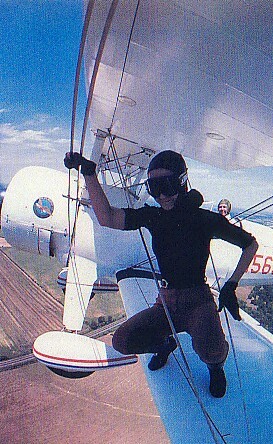 Ron David went to the CAA and the Flight Standards District Office and asked John Hutchinson for permission so the wingwalker could move from and back to the cockpit and be safely strapped in for take off and landing. Permission was granted. Bill Fizsimmons was one wingwalker with Ron but his first regular wingwalker was Jim Bradley. Their chariot was a 450 horse powered Stearman bi-pane. The year was 1975. The next year, 1976, Jim was unable to continue the act due to a transfer and Ron paired up with Hank Henry. Hank Henry had the former job of testing new parachute designs for the Marines. He was strong, wiry, and he had a special intuition out on the wing. He may hold the distinction of being the first African American to wingwalk since the five Blackbirds wowed crowds in the 1920s. Hank too was transferred at the end of the year and Ron was looking for a new wingwalker. He placed an ad in the Washington post and had 50 people call. 25 of the applicants were very qualified for the job, like skyscraper construction etc. Now we return to Nour. She was working as a photo journalist covering the white house. Someone, had cut the ad out of the Washington Post and pinned it up on a bulletin board and just so it wasn't missed circled it in red. Nour's fellow press buddies saw it and brought it to her attention. She thought it would be fun and responded "I'll answer the ad and tell him I'm 65 and weigh 300 pounds." In the following phone conversation, Ron and Nour discovered they had been in the same parts of the world, like Geneva, Beirut, Yemen, New York, at the same time but had never met. She never did tell him her wrong age or weight. The audition took all day. Ron taught 12 people to climb up to the top wing and back down again. After ground training he would take them for a flight and have them wingwalk. 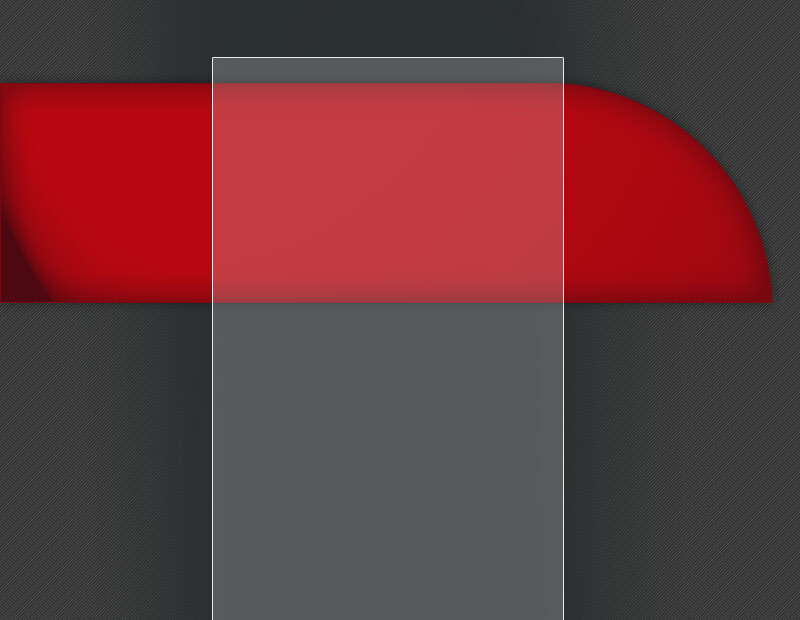 That last to show up was Nour. She was five hours late due to a presidential press conference. Ron taught her to climb up and climb down and she was a natural. He called her the o.k. girl because everything he told her to do she said o.k. They went flying and Ron saw she was full of confidence and decided to do a barrel roll. He motioned for her to climb back down into the cockpit to see how she liked it. "O.k. fine." So he told her to climb up again and he flew a loop. She got the job. They performed 26 shows at the Flying Circus Aerodrome plus some others. Toward the end of the year, during a show, another pilot flew into Ron's tail. Using power management Ron safely landed the Stearman, albeit upside down. A good landing is any landing you can walk away from and both Nour and Ron walked away. The mid-air was a catalyst in their destinies. Today they live life to the fullest. Ron is starting an Internet podcast series and Nour, a respected photo journalist, still gets up on the wing. She recently wingwalked with the Utterly Butterly Display Team in the UK inspiring all around the world. Click here to visit Ron David's web page. I was looking through your site and noticed an error on the page about Ron and Nour David that you might want to correct. In the paragraph about the birthday surprise for Ron, the airplane was a 1928 (not 1929) Travel Aire 2000. The pilot, a good friend of mine was Gene Rambo, not Squeak Burnette as stated. He spent 12 years restoring the airplane himself. I know this as I was there and helped put the event together including showing Meleksah what to do. I also did an official wing walk that day for the airshow on that same plane. It took place at great Meadows for the 4th of July airshow. They launched the flying Circus aerodrome and Ron was already at Great Meadows announcing the festivities. It was a complete surprise when the airplane arrived with Nour and Meleksah on the wings. We apologize for any misinformation. We have never been to the Flying Circus nor are we familiar with all the details of planes, pilots, and wingwalkers in the Flying Circus. 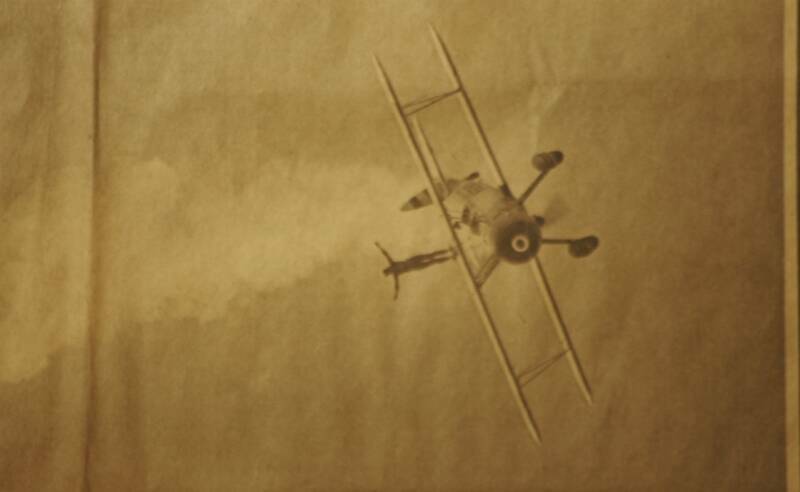 This site tries to show respect for all wingwalkers and their pilots and allow them to tell the story in their own voices. We do thank everyone for taking the time to tell us their stories. Sometimes they are told to us over the phone and in our efforts to keep up with the conversation we may not have written all our notes correctly. Our focus is preserve these stories and honor them. Tiny Nour out on the wing.